I recently had the good fortune to accompany other American journalists on a press trip to the Midi-Pyrénées region (southwestern France). Art and gastronomy were the focus of the voyage, and the gastronomy was extraordinaire with four and five course meals for both lunch and dinner on most days. We savored cuisine at restaurants whose chefs are famous, restaurants with Michelin stars, as well as a few restaurants that were ordinary at best. We visited colorful markets and tasted the area’s wine. 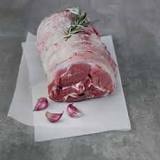 Following are highlights of our culinary experiences. The week-long journey got off to a smashing start with dinner at Michel Sarran in Toulouse, France’s fourth largest city and the capital of the Midi-Pyrénées. The ambience in this two-Michelin star establishment named after its renowned chef is classy, elegant, modern. The food definitely wins stars for appearance and presentation. 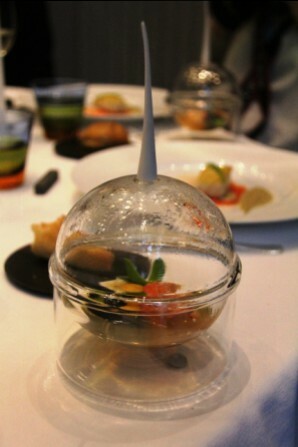 Each course (we had four) was a painstaking work of art with numerous bites of exotic creations, such as sea urchin mousse and hay ice cream. As in most fancy French restaurants, the food descriptions are daunting. First course: La volaille de Monsieur Duplantier en crème onctueuse aux écrevisses, suprême poché au citron confit et raz el hanout, peau croustillante. Basically tiny pieces of chicken in a crayfish sauce with a delicious citrus flavor surrounded by delicate tidbits of other edibles. The main course was the overall favorite: Pigeon du Mont Royal (pigeon filet). The succulent bird was served with a tiny nest-like creation: Suprêmes frits en kadaïf et jus à l’encre – (a middle eastern cheese pastry with octopus ink), plus other petit delicacies. 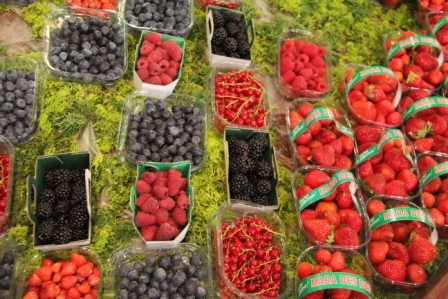 Markets offered a profusion of berries. For dessert, a wild strawberry melange with a lemon basil sauce, lime crumble and the hay ice cream (lait glacé au foin). Lunch the following day at the outdoor terrace of Emile, a Toulouse favorite in the bustling Place Saint George, was a winner. 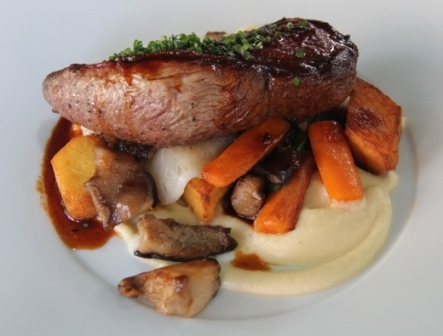 Chef Christophe Fazan is known for both creative cuisine and local favorites. 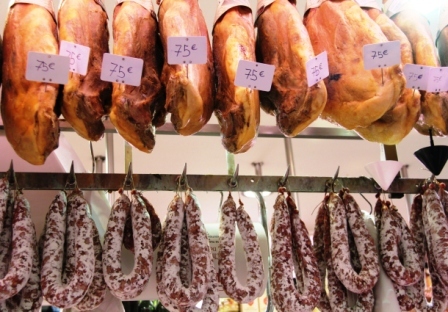 Hams and sausages are popular in southwestern France. 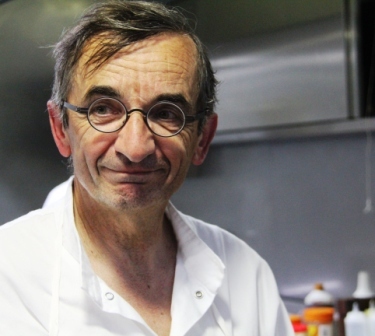 While Michel Sarran’s food was good, most of us preferred that of Christian Constant, another renowned French chef. 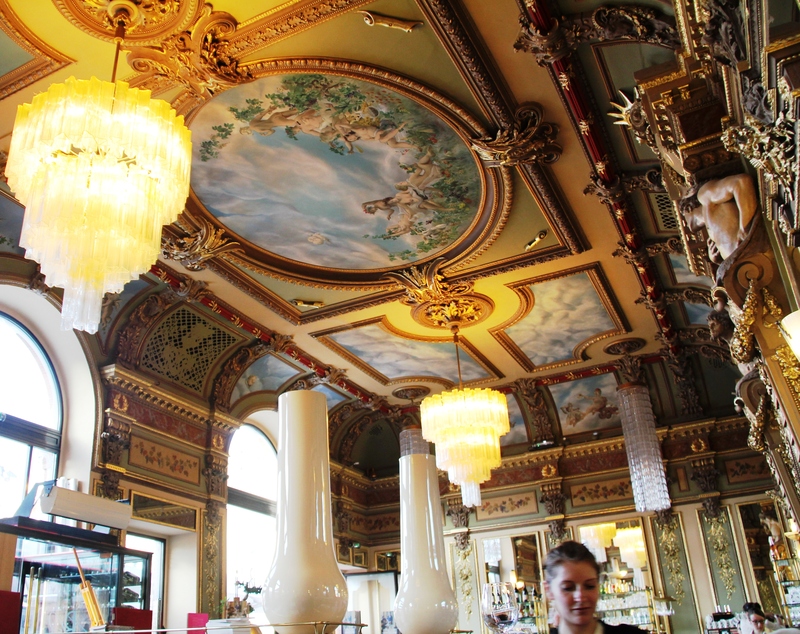 His restaurant, Le Bibent, features glamorous baroque/art nouveau décor and great food. My first course, a tartare of several kinds of fish and oysters with a hint of ginger served in oyster shells, was excellent, and better than my main course, a confit of lamb. 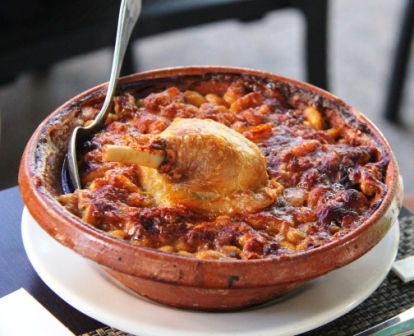 Confit or preserved meat is yet another regional favorite with duck confit the most popular. 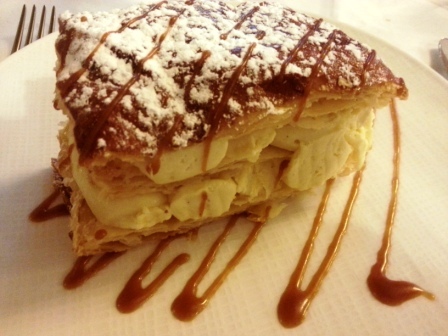 An incredible dessert followed: a gigantic mille feuille. This pasty whose name translates as “a thousand leaves” is layers of thin, flaky pastry with custard in between. Constant’s version is enormous, yet light and yummy. 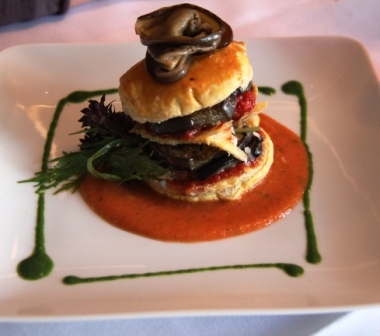 Isabelle won high marks for originality with this “eggplant burger,” but it was bland. 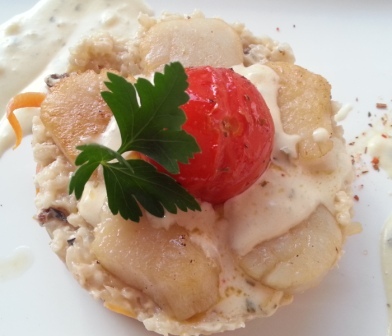 Scallops and risotto — appearance isn’t everything. 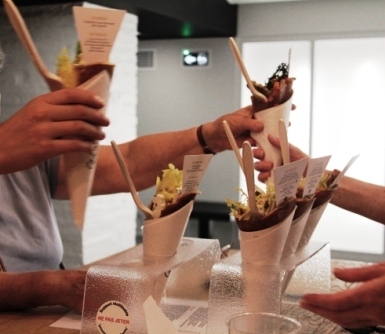 shy about trying unknown foods – all part of the taste experience. For lunch in the town of Conques, I bravely ordered the first course: gateau aux oreilles et pieds de cochon, vinaigrette à la moutarde (cake of pig ears and feet). The French let no part of an animal go to waste, but in this case, they should have. The cake was tasteless. Not so the boudin noir (blood sausage) served with apples, onions and potatoes and rich in flavor at Le Clos Sainte Cécile, a lovely restaurant in the town of Albi where we sat in the garden under plane trees. Dinner at the Hervé Busset restaurant won hands down as the favorite meal of this epicurean voyage. This was the trip finale with both an overnight and dinner at the one star chef’s hotel and eatery in a renovated ancient mill in a wooded setting on the banks of the Dourdou River just outside of our favorite town, Conques. 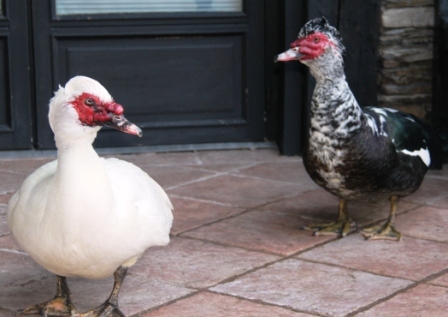 Black and White, lucky pet geese at Herve Buset. Their livers won’t end up on someone’s dinner plate. After a week of extravagant eating, I was ready for a Big Mac, but the zipper on my jeans told me it was time for starvation. Comments welcome and appreciated. Today’s Taste features a recipe for Chilled Avocado Soup topped with Crab. My guests loved it!. See “Today’s Taste” at the top of this post. While you are up there, sign up to become a Tales and Travel follower. 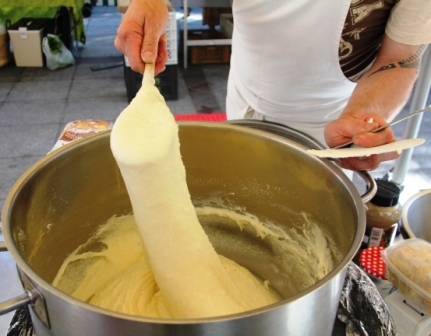 Aligot, a puree of mashed potatoes and the local cheese, Laguiole.